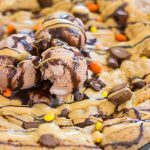 This M&M’S® Caramel Chocolate Chip Skillet Cookie recipe has crispy, golden edges, and so much soft, gooey, chewy middle! It’s chock-full of chocolate chunks, chocolate chips, and caramel! Serve it with ice cream and caramel sauce for a super simple and quick-to-prep dessert! Good morning! How was your long holiday weekend? I hope it was filled with sun and fun and relaxation. Mine was BUSY. I’ve been going ham in the kitchen the last few weekends. 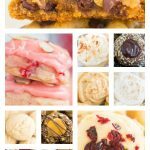 All I’ve done is bake up a storm of fall recipes. If I’ve been quiet on the blog, it’s because I’m so busy creating in the kitchen. In a week or two, you won’t stop hearing from me, but I think you’ll be happy about it. 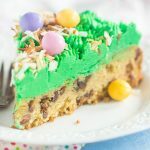 This M&M’S® Caramel Chocolate Chip Skillet Cookie is one of many, many recipes I made this weekend, and it was one of my faves! 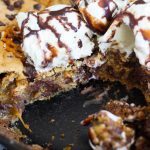 I could go on and on about how much I love skillet cookies (and I have in this Red Velvet Chocolate Chunk Skillet Cookie and this Peanut Butter Chocolate Chip Skillet Cookie recipe), but I’ll spare you today for the most part. 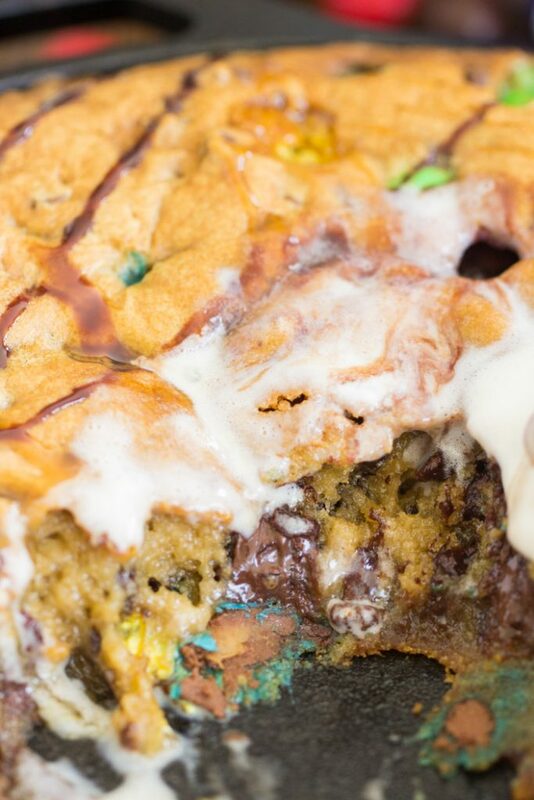 Suffice to say, a skillet cookie is absolutely awesome because it’s a fraction of the work of traditional drop cookies, and they’re kinda better anyway because you get waaaay more gooey center. Crispy, golden edges, and so much soft, gooey, chewy middle. 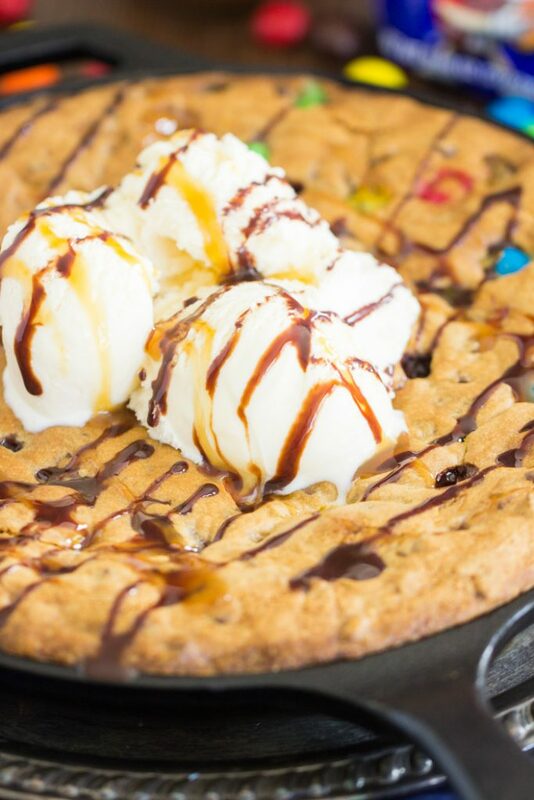 And I’m telling you, it does not get easier than this M&M’S® Caramel Chocolate Chip Skillet Cookie recipe. You can prep it in 10 minutes. 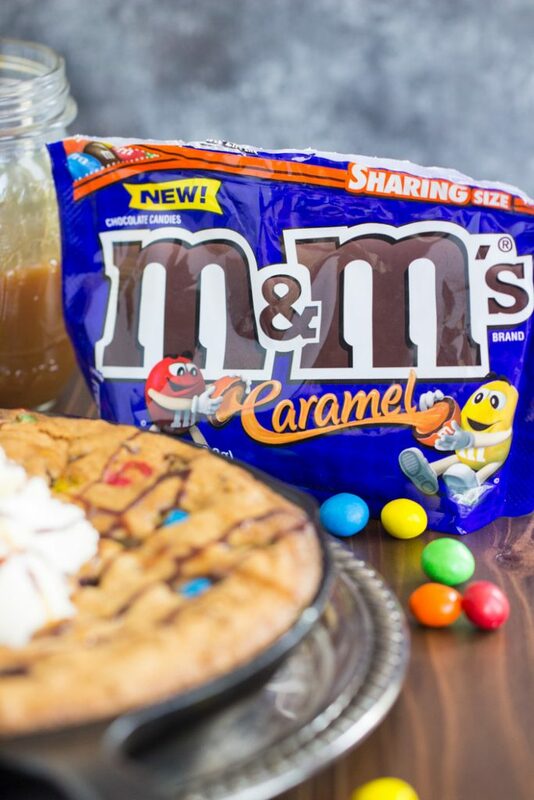 When I learned about the new M&M’S® Caramel, I knew I immediately that I wanted to make a skillet cookie. 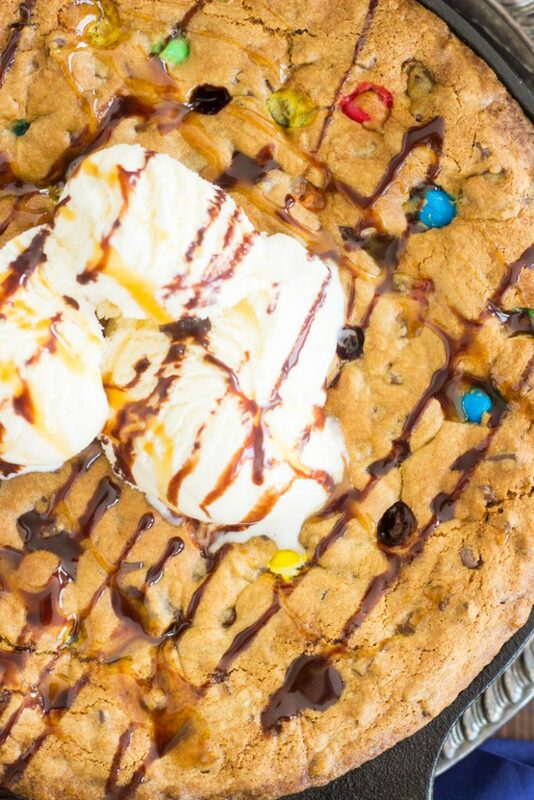 An M&M’S® Caramel-loaded chocolate chip skillet cookie. How perfect is that combo of flavors? 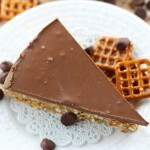 If you are looking for a fun, creative, delicious way to “unsquare caramel,” look no further. Start with this simple skillet cookie! I actually first picked up these M&M’S® Caramel at Walmart when I was on vacation. I stopped into Walmart to grab a few things I needed on my trip, and I spotted the M&M’S® Caramel at the front of the store when I was checking out. I was so intrigued that I grabbed two bags. I shared a bag with my family while we were on the trip, and I took the other bag on the plane trip back with me. 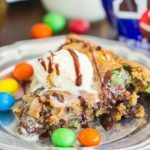 When I got home to Tampa, I went back to Walmart to pick up more bags to make this M&M’S® Caramel Chocolate Chip Skillet Cookie. 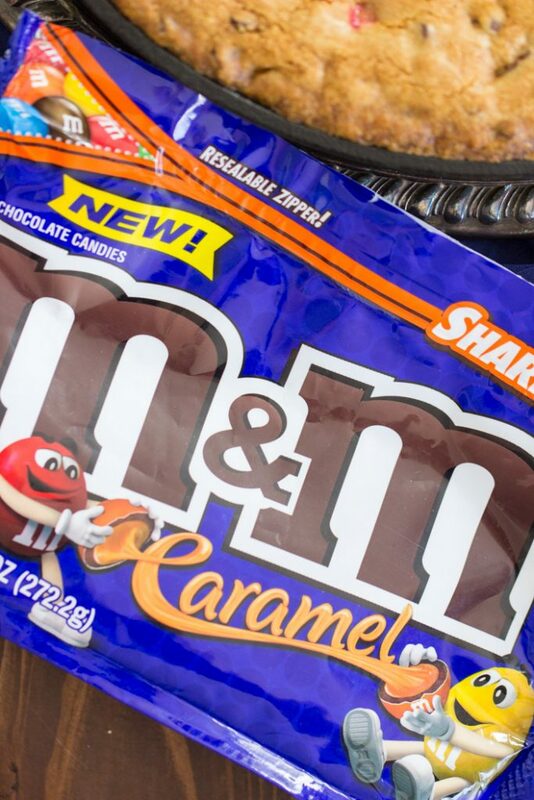 You can find M&M’S® Caramel at Walmart as a permanent part of the M&M’S® line. These will not be limited edition, thank goodness. When you find something you love, you want to have access to it whenever you want it! Anytime you want to live on the wild side and “unsquare caramel,” or you’re just in the mood for caramel and chocolate goodness in a candy, you can grab a bag. With the addition of M&M’S® Caramel, this is the biggest launch in M&M’S® history! A completely brand new candy! These have a smooth, sweet, creamy caramel center, are coated with rich milk chocolate, and are enclosed in that familiar, signature candy shell. Believe it or not, these candies took years to perfect. It was trickier than you’d think. The “lentil” inside each candy had never been filled with such a soft center as the caramel. The engineers had to configure a way to keep the chocolate at the right temperature and consistency so that the “lentil” inside each M&M’S® Caramel candy wouldn’t melt or collapse. Neat, huh? I think it’s so interesting that these candies took years to perfect, but my favorite part about this is learning that they call the center a “lentil.” Is it me, or do you also think that’s an adorable name?? I just love that. 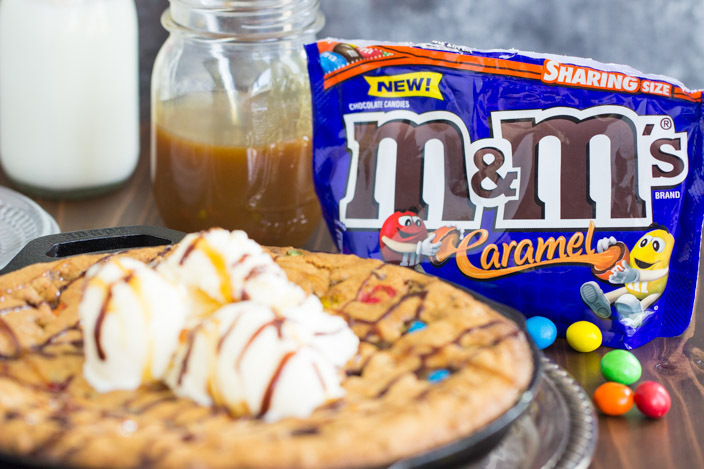 I was blown away by the new M&M’S® Caramel, and I hope this M&M’S® Caramel Chocolate Chip Skillet Cookie recipe inspires you to pick up a bag or two. It was a really simple, but delicious way to “unsquare caramel”!! In a large mixing bowl, beat brown sugar, sugar, and butter until fluffy. Add egg, milk, and vanilla, beating until combined. Add to mixing bowl gradually, beating until combined. 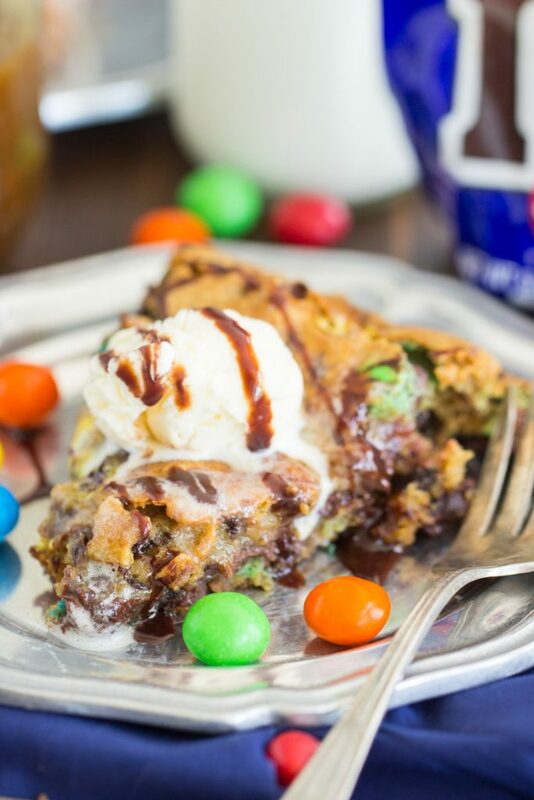 Fold in chocolate chunks, mini chips, and M&M’S® Caramel. Spray a 10-inch cast-iron skillet with non-stick spray. Spread the batter into the skillet. Bake at 325 for 40-45 minutes, or until edges are golden and a toothpick inserted near the center comes out clean. You may have to poke it in a few places to make sure it's set in the center, since there's a lot of chocolate and chips in the cookie. Cool for 20 minutes. Cut into slices. Serve warm with ice cream, chocolate sauce, and caramel sauce. Yes!!! The new M&Ms are fabulous! And they make such a great addition to cookies and baked goods. M&Ms are so easy to toss into baked treats. So glad you like the recipe! Omg, I know, the Peanut Butter ones are amazing too!!! And I never tire of the classic M&Ms and Peanut M&Ms. They’ve got so many good ones!